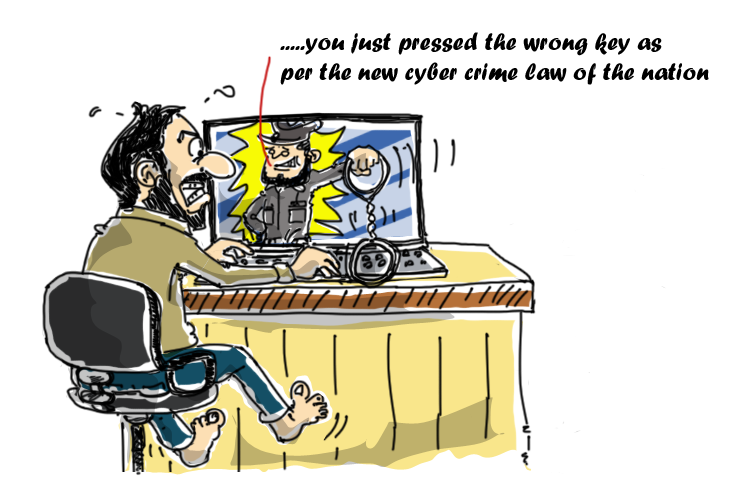 The Prevention of Electronic Crimes Bill 2015 (PECB) that has been approved by the National Assembly’s Standing Committee on Information Technology is about to become law of the land. The Bill must be approved by Senate before it can be signed into law. If the Bill is in the same form as the previously ‘criticized one’ then we are definitely in trouble, especially regarding our expression and opinion on national policy and important issues of public importance on social media. This law could be used for prosecuting any Pakistani who has committed a cyber crime within Pakistani boundaries. Cyber crimes as per today’s IT age are much diversified in nature and execution. Major crimes like spoofing, hacking, misrepresentation and fraudulent information are not the only highlights of cyber malworld as many new have joined the list. IT is now the name given to the modern global world. From e-commerce, banking, business presentation, communication channels like email and social media to entertainment and education – everything is just a click away. The use of internet around the globe has rapidly grown. From 2005 onward, the use of internet in Asia, particularly in Pakistan, has grown manifold. This rapid boost in internet usage is the reason the entire world is constantly updating cyber laws while keeping into consideration that they may not infringe privacy and may not breach the rights of speech, expression and communication. The cyber crime Bill of Pakistan is in clear derogation of all these aspects discussed above. The Bill was drafted so poorly that it not only contains vague and unclear use of certain terms but also leaves a big margin and scope for misinterpretation and misuse. Many sections of the cyber crime Bill are criminalizing the general use of internet and are also in clear derogation of constitutional rights of speech, expression and communication. If this Bill gets enforced, 80% of general Pakistani internet users would hear the cyber crime bell constantly ringing in their ears. It is noteworthy that NA’s Standing Committee approved the Bill within a few hours after critics raised converns. Standing Committee’s representation included only PML (N) members. 14 PML (N) members out of a total of 20 members of the Committee were present and approved the Bill without any objections. Five out of six remaining members from other parties didn’t participate in the meeting. So the fact is that Standing Committee’s approval for the cyber crime Bill doesn’t represent any party other than PML (N). This is alarming. “Whoever with malicious intent gains unauthorized access to any information system or data shall be punished with imprisonment for a term which may extend to six months or with fine which may extend to one hundred thousand rupees or with both”. Use of the term ‘malicious’ is very unclear. This term is not defined well and there is no clarity as to exactly what things are malicious and what are not. Anybody can call another’s intents malicious, so they would already be on the fence. Highlight is that one can be in jail for a period of six months for even just touching a phone by mistake. More interesting fact is that the term ‘unauthorized access’ may result in penal actions even if it is done mistakenly and even if it results in no harm. It’s just as if you pressed a key on my laptop and I get you convicted for accessing my device with malicious intent. Since I am discussing the worst case scenarios, another is that you can be picked up by law enforcement agencies (LEAs) if they think you are involved with some malicious activity, and they can do this by obtaining a warrant from the court without having proved anything. Provided that the Federal Government or the Provincial Government may, as the case may be, constitute joint investigation team comprising of the officers of special investigation agency and any other law enforcement agency including Police for investigation of events involving commission of offences under this Act and any other law for the time being in force. (2) No person other than a prosecutor designated as such by the special investigating agency shall prosecute any offence under this Act. Moreover the LEAs can confiscate your computer and phones right away. Section 25: Expedited Preservation of data. (b) there is a risk or vulnerability that the data may be modified, lost, destroyed or rendered inaccessible, the investigating officer may, by written notice given to a person in control of the information system, require the person to ensure that the data specified in the notice be preserved and the integrity thereof is maintained for a period not exceeding ninety days as specified in the notice. (2) The period provided in sub-section (1) for preservation of data may be extended by the Magistrate if so deemed necessary upon receipt of an application from the investigating officer in this behalf. Now most people have actually favored the blocking of blasphemous and anti-state content – so have I. But with this new law, any website that the Pakistan Telecommunication Authority (PTA) might disapprove of, can get blocked. Or if it incites an offence. In other words we may conclude that PTA will be able to block any content on the internet without asking anyone. One cannot challenge the PTA in the courts as they have a law to defend them. (1) The Authority or any officer authorized by it in this behalf may direct any service provider, to remove any intelligence or block access to such intelligence, if it considers it necessary in the interest of the glory of Islam or the integrity, security or defense of Pakistan or any part thereof, friendly relations with foreign states, public order, decency or morality, or in relation to contempt of court, commission of or incitement to an offence. (2) The Federal Government may prescribe rules for adoption of standards and procedure by the Authority to monitor and block access and entertain complaints under this section. (3) Until such procedure and standards are prescribed, the Authority shall monitor and block intelligence in accordance with the directions issued by the Federal Government. So some of you better close your pages and start doing something else because cyber crime Bill would put you behind bars with a fine of up to Rs. 1 million for creating and publishing certain memes. (1) Whoever dishonestly and publicly exhibits or displays or transmits any false electronic communication, which is likely to harm or intimidate the reputation or privacy of a natural person shall be punished with imprisonment for a term which may extend to three years or with fine up to one million rupees or with both. (1) and the Court on receipt of such application may pass such orders as deemed proper for securing, destroying, blocking access or preventing transmission of such material. So naturally, all memes, cartoons or caricatures are going to get forbidden in the land of the pure. No more trolling on the internet again as publishing a picture of the Prime Minister or other notable personalities can fine you with up to Rs. 1 million. That means publishing the pictures of anyone without their consent or knowledge can put you behind bars for 2 years and/or with a fine of upto Rs. 1 million. Violence to any person, commits the offence of cyber stalking. Provided that if the victim of the cyber stalking under sub-section (1) is a minor the punishment may extend to five years or with fine upto ten million rupees, or with both. (3) Any person may apply to the Court for issuance of a restraining order against an accused of cyber stalking and the Court upon receipt of such application may pass such order as deemed fit in the circumstances of the case including an order for removal or destruction of, or blocking access to, such material. “Provided, nothing under this sub-section(1) shall apply to anything aired by a broadcast media or distribution service licensed under PEMRA Ordinance 2002 (XIII of 2002)”. That means if you are part of print media or electronic media then you could get away with publishing memes. Question arises as to what kind of law this exactly is – holding one thing lawful and unlawful at the same time? The approach as per setting the punishment for each listed crime in the Bill seems irrational. For example, if a kid hacks a website then he can be sent to jail for 14 years which is way beyond common sense. A more rational approach towards punishments is needed in Pakistan where corruption and lawlessness is at its peak. There must be some safeguards in place to make sure that politicians aren’t given a free hand to use the law against innocent citizens. If the Bill gets passed in its current form (which is expected to be much worse than the version I produced above), it will negatively impact everyone (individuals, businesses, media etc.). More attention is needed towards the fact that this Bill, that is passed in a speedy manner through the National Assembly, does not let ministers and political parties harass and confiscate the right of expression of innocent citizens. The term ‘malicious intent’ has not been defined clearly and there is huge scope to misinterpret and misuse the entire Bill probably. The Bill is clearly affecting the growing interest of nationals in policies of political parties as reportedly from the last 2 years the young educated lot of Pakistan has taken keen interest in political parties, their agendas, policies and expressing their interests via Twitter, Facebook, Instagram many other social platforms. I hope the latest version of a copy of this law does not have anything like the above and that parliamentarians have paid due attention to all these issues. If yes, then praises for the government – if no, then we’ll be facing another wave of restlessness as usual. The writer is a professional researcher and an independent legal consultant, practising in the areas of business and corporate law since 2012. She has also served as a legal researcher and project manager in a UK based company. She has been writing through different platforms since 2009, including Management Paradise, Academia.edu and Google Blogger.